I’m really happy with both results. Missing by 15 points over the course of a 16 game season is about as close as I could ever expect to get. Also of note: while I was generally on the mark, I slightly underestimated the team each time. It’s hardly a trend (just 2 seasons of data), but it’s something I’ll be watching for this year. If it happens again, perhaps I can start to adjust for a naturally pessimistic bias. The Eagles finished 13th in offensive DVOA from Football Outsiders. In 2013, they finished 3rd. The team scored 1.98 points per drive last year, 13th in the league. The Eagles scored 3.1 special teams points per game last season (Teamrankings.com). The second place team, Buffalo, scored just 1.3. The Eagles scored 1.8 defensive points per game. As you can tell, the offense took big step back last year, but it was masked by excellent, and likely unrepeatable, performance by STs and the defense. Why was it so bad? (1) Nick Foles only started 8 games, and when he did start he didn’t play nearly as well has he had in 2013. (2) Turnovers. The Eagles had .174 turnovers per offensive drive last year, which was worst in the league. So on more than 1 out of every 6 offensive drives, the Eagles turned the ball over. It’s really hard to score when you forfeit that many possessions. The good news is: there’s a new quarterback, and he has a long history of very low turnover rates. Moreover, turnovers themselves have little-to-no persistence from year to year. Stay with me here for a few paragraphs, we need to get in the weeds a bit. Last season, the league average for turnovers was 23. The Eagles had 36. So…if the Eagles revert to league average, that’s 13 extra possessions. If we also adjust on the takeaways side, we get to 9 extra possessions. Last year that would have resulted in 17.82 extra points for the team (using the average pts per drive), or 1.11 per game. If we assume a more efficient offense (better QB play almost certainly gets you there), it has an even bigger effect. I detailed those numbers because we also have to go against the team. They simply will not score as often on D and STs as they did last year. A lot of writers have mentioned this, but not everyone has counterbalanced it with the TO reversion. If we assume the Eagles return to the middle of the pack for defensive scoring, that costs them .5 pts per game. On STs, doing the same costs the team a lot more, something around 2.5 points per game. In total, that’s 3 points per game that the team likely can’t count on this year. Note though, that the 3 point estimate is high. If the Defense and STs hadn’t scored the 11 touchdowns they did, the Eagles offense would have gained another 11 possessions. At last year’s average, that would have been worth 1.36 points per game. If we adjust for that, we get to 1.64 points per game from D and STs that the team can’t rely on. Of course, we know from above that the expected giveaway reversion is worth an added 1.11 points per game! That was a very long way of saying that the mean reversion on the TO side and the D/STs scoring side come close to balancing out, leaving a deficit of just 0.5 points per game. We can certainly argue around the margins for the right way to correct for some of those things. My method is very back-of-the-envelope. But given the uncertainty and margin of error for any assumptions we make, I don’t think the result will change. So don’t worry so much about the D and STs not scoring this year. It means that, IF the Eagles turn the ball over at a more normal rate, then last year’s scoring rate wasn’t actually inflated by the D and STs. That’s really important, because last year the team produced points at a rate of 29.6 per game. If we take out the 0.5 points per game from above, we get to 29.1 ppg. That was 28.8% better than the league average of 22. For reference, in 2013, the Eagles scored 27.6 per game, which was 18% better than league average. Can you see where this is headed? If the Eagles natural scoring rate from last year was 28.8% better than average, than any improvement could lead to an extremely powerful offensive team. This is the big one, for obvious reasons. If Sam Bradford is healthy, he has a chance to duplicate Foles’ efficiency from 2013. Bradford has a very strong arm and, for his career, an interception rate of just 2.2%. But…we can’t overlook the fact that he’s played 49 games in the league, a big sample, and has been firmly mediocre. In particular, his career adjusted net yards per attempt, at 5.17, is really weak. I know a lot of people blame that on his lack of support, which is reasonable, but we shouldn’t just ignore it. That said, I think Bradford is an excellent fit, and Chip’s offensive system has proven it’s ability to elevate QBs beyond their previous performance levels (see Mark Sanchez, or even better, buy the Eagles Almanac for an in depth look at the issue.) However, given Bradford’s career statistics, it seems foolish to expect 2013 Foles’-level performance. If healthy, though, I think he gets reasonably close. Now a note about health. I have no idea if Bradford will stay healthy. I’ve heard the 12% re-injury rate number, so let’s go with that. But, we have to assume that there is a LARGE margin of error in that number. To be conservative, let’s just assume for a moment that the real ACL re-injury rate for Bradford is 20%. That’s really high, but it also means he’s got an 80% chance of NOT re-injuring the ACL. So in terms of expectations, it’s still pretty clear that he’s much more likely to make it through the season than to go down. The Eagles need a healthy Bradford to have any hope in the playoffs. Stepping out of this analysis, my gut says the team wins 3 out of every 4 games Bradford plays and goes .500 in the rest. That means 8 starts gets you to 10-6 and a good chance at the playoffs. I’m more worried about the OL than most people seem to be. Barbre and Gardner are both huge question marks at G. Fortunately, Guard is, relatively speaking, an inconsequential position. If the team has to have a weakness, I’m happy it’s at Guard. But…there’s a chance at least one of these two guys is terrible. I hope that’s not the case, and neither seemed like a massive problem in the preseason, but the risk is there for now. Kelce is what he is, one of the most athletic Centers in the game and a rock in the middle. Beyond that, depth is an issue and the unit is still heavily reliant on Jason Peters as it’s star. Lane Johnson seems primed for a big step forward, and that would go a long way to assuaging my concerns, but behind these guys there isn’t much to feel confident about. When you factor in the reliance on the running game, you can see why one or two injuries to this line could cause the whole season to unravel. As it stands, I’m optimistic, but if you’re looking for an underrated risk to the team, this is it. The good news, in a strange way, is that last year the offensive line wasn’t great. From Football Outsiders, it ranked 29th in run blocking and 9th in pass protection. Since we’re just trying to adjust our performance expectations from last year, that means the line doesn’t need to be amazing to take a step forward. At the very least, repeating last year’s performance seems like a reasonable expectation. Very little to say here. From a pure “on-the-field” basis, I really like essentially trading McCoy for Murray and Mathews. I’m ignoring the cap allocation aspects for now, because this analysis is only concerned with this season. At the very least, the M&M combo is more resilient to injury risk than McCoy, even with the injury history of both players. I’m excited. Jordan Matthews looks like a potential star, and I’m excited that Chip Kelly liked Agholor enough to take him in the first round. I know that’s a strange way of thinking about it, and whether it was a smart pick is a different question. Losing Maclin hurts, but I think Matthews’ development can pick up of the slack. Expected overall performance probably declines a bit, if only because rookie WRs should always have low expectations, but I don’t see a major drop-off from last year. Last note: depth is an issue here as well. If Matthews goes down, the WR corps suddenly looks pretty weak, barring a crazy debut from Agholor. Riley Cooper is a non-factor to me. I think he’s a pretty bad player that capitalized on one high-usage season, but he shouldn’t be expected to perform any worse than he did last year. Pulling it all together, and ignoring scenarios involving major injuries, I see a big improvement at QB coupled with a smaller improvement at RB and a slight decline at WR. Together that would seem to lead to a better offense than last year. Since last year’s rate was +28.8%, we’re left with a pretty aggressive base-case expectation. I’m setting it at +34%. I’m only pushing the upside case to +40%, because to go any higher would push us into serious outlier territory, which is a hard place to be for a prediction. On the downside, I’m setting our expectation at +15%, which would be the worst points production rate thus far for Chip. Last season, the Eagles’ defense ranked 10th by DVOA. The pass defense ranked 18th, the rush defense ranked 7th. The Eagles allowed 23.9 points per game, 17th in the league and 2% worse than average. The team allowed 1.85 points per drive, 15th in the league. The team allowed 29.34 yards per drive, 7th in the league. There are no huge red flags for mean reversion on the defensive side from last year. The team had 16 fumble takeaways last year, against a league average of 9.5. Overall, the team had 28 takeaways versus a league average of 23.6. The fumble number is high, but the overall TO count was reasonable. We can adjust for the 4 extra turnovers (though there are reasons to believe the Eagles will force more turnovers than the average team) the same way we did for the offense. That gets us to an extra 7.4 points or .46 points per game. That pushes the defensive performance to 4.2% worse than average. This might be the strongest unit on the team. Cox is at the beginning of what should be a long stretch of dominant play. Bennie Logan has developed into a better player than I (or anyone else) expected at NT, and Cedric Thornton is a very solid 3-4 D-E, especially against the run. The players haven’t changed, so our only question is whether we think the group will get better organically or get worse. I don’t see any reason they’d get worse. There’s a chance for continued development, though, so a small improvement is possible. A stronger LB corps. behind them should help as well. This is a wildcard for me. Barwin has been tremendous and should continue at the same level. Graham has grown into his role, and seems ready to take another step forwards. Regardless, I think trading Cole out for Graham is a likely improvement just based on last year. In the middle is where things get tricky. Demeco Ryans’ role is unclear. I don’t expect much from him this year, and given his age (31) and the fact that he’s already played 126 games in the NFL (regular season), it’s fair to wonder if he’ll decline much more quickly than one might expect. The good news is the team added Kiko Alonso, who has the potential to be a very good LB. As a rookie, he showed star potential. Therefore, the upside of a Kendricks/Alonso combo is huge. They’re both very fast, athletic LBs who could, if used correctly, form the most disruptive ILB duo in the league. Unfortunately, Alonso has some serious durability questions, and even if he’s healthy, it’s unclear if he’ll be able to regain the form he had his rookie year. If healthy, there’s potential here for a big improvement, but the uncertainty gives me pause. Instead, I think a small step forward is a better expectation for this year. If Alonso stays healthy and works himself back into shape, though, next season could be dominant. Depth is an issue, especially on the outside, but Barwin has been very durable, playing in every game over the past 4 seasons. Graham, similarly, has played in all 16 games for 3 seasons straight. I still have no idea how Vinny Curry will be used, but he’s a great piece to have, even if he just comes in pass-rushing situations. The Eagles’ biggest offseason move, to me, was signing Maxwell. And I have no idea how good he is. If he play’s like a true #1 CB, then it’s going to be hard for this unit not to improve from last year. If he turns out to be a guy who benefited from a great scheme and talent around him, though, things could get ugly. I’m guessing he’ll be solid, not great, which would still be an improvement over Cary Williams. On the other side, it looks like Nolan Carroll is going to be the starter, and might move inside to the Nickel when the defense shifts to that formation. I’m not excited by Carroll, he’s just a guy. BUT, similar to several positions above, he doesn’t need to be great. Bradley Fletcher was not good last year. So just mediocre play from Carroll should help prevent a decline in performance from this unit. I think Carroll can be mediocre. In the nickel package, Eric Rowe will have to play. That might be a problem. In any case, there’s no objective way to expect anything other than a step down from what Brandon Boykin provided last year. (I know I just said Carroll would rotate in, but I’m really talking about the 3 CB tandem here). Depending on how often the team moves to that package, the improvement from Maxwell could be quickly drowned out if the rookie isn’t ready to contribute. At Safety, Jenkins is solid. Thurmond has never played Safety before, but filling in for Nate Allen really should be that hard. He looked solid in preseason. I think it’s likely he turns out to be at least a small improvement over Nate Allen. Once again, depth is a big issue, but last year’s corps was such a mess that a big step down seems unlikely. It looks like the defense is likely to improve slightly. There is, without a doubt, more high level talent on defense this year than last (Alonso and Maxwell additions). How they’ll fit is anyone’s guess, and depth outside of the DL is an issue. I’m betting on the talent though. Last year’s points allowance rate 4.2% worse than average (adjusted). I’m setting our base case at league average. Note that by DVOA, I think the Eagles will finish in the top 10 on D again. Due to the pace of the game, though, that doesn’t map directly to points. On the upside, if Alonso is full-speed soon and Maxwell plays as well as his contract suggests he’s worth, 7.5% better than average is eminently reachable. On the downside, I’m putting a floor at 10% worse than league average. STs performance has no persistence from year to year. That’s why I’ve adjusted the Eagles to league average. Of course, the unit was amazing last year, and it’s possible the extra attention or coaching the team devotes to STs has produced a sustainable advantage. I haven’t seen enough to assume that though, and since STs is generally a small part of the game with no persistence and a lot of variability, I just zero it out. Think of it as an error factor thrown onto the end of the final equation. If the Eagles come anywhere close to matching their STs performance from last year, the team could challenge for home-field advantage. So let’s combine our scenarios just as I did last year. Scoring was actually down overall last year, at 22.6 points per game per team (23.4 the year before). That went against the previous trend of 0.6 points per game annual inflation from before. For this year, I’m going to use 23 points per game as a projected average, and guess that last year’s decline did not represent a fundamental change in the game. Also note that I’m not trying to adjust for effects of the new extra point rules. I don’t think they’ll make a big difference this year (but hope I’m wrong about that). Our base case gets us to an expected point differential of 125, which results in a win projection of 11 (10.98 to be exact), using Pythagorean wins and a 2.67 exponent. The average and median value is 10.5 wins. So there you have it. Barring any major injuries to Bradford, Peters, Cox, and Maxwell, I project the Eagles to win 11 games. That SHOULD be good enough for the division crown, and it’s almost definitely good enough for a playoff spot. That’s why it’s important to focus on areas for potential regression…. As I said in yesterday’s season projection, two major areas of concern this season are Nick Foles turnover regression and health, particularly along the O-Line. My guess is, after yesterday, those issues are no longer under any fan’s radar. To reiterate, my theme for this season is: similar results as last season (at least record-wise), but very mixed feelings. Yesterday fit that perfectly. Fortunately, the Eagles were able to pull through, largely on the strength of excellent Special Teams (fairly big surprise) and a strong defensive performance outside of a few early breakdowns. Now for a few individual factors I’m looking at/thinking about. As usual, I’m going to try to avoid the “obvious” story lines, you can get that elsewhere, unless they’re really important and I think I have something to add to the discussion. Blue Chips – Pulling from yesterday, this is the most important aspect of this season. The Eagles will not become a consistent SB contender without developing a few high-impact players. Fortunately, things were fairly positive on this front for the team. Mychal Kendricks looked like one of the best players on the field. He had 6 tackles, a sack, and a pass defensed. Fletcher Cox also looked very good (despite having his best play erased by a bogus penalty.) He also had 6 tackles, plus the spread-beating fumble recovery and TD run. On the flip side, Foles obviously struggled. More on him in a second. Boykin looked good when he was on the field…but only played 23 defensive snaps. That’s less than 1/3 of all defensive plays. Hopefully one of the beat writers will ferret out the reasoning for Boykin’s lack of PT, but until then we’re left watching to see if it becomes a trend. Zach Ertz has 3 catches on 5 targets, hitting a couple of big plays on seam routes. I’d be very surprised if his role in the passing game doesn’t get bigger soon. Jordan Matthews also had strong debut with 2 catches (4 targets) for 37 yards. That doesn’t sound like a lot, but remember that rookie WRs very rarely make significant contributions. If Matthews can grab 2-3 balls each game, he’ll have done really well. Nick Foles – I’m not going to dwell too much on Foles since every other writer will cover him. I did, however, want to toss a theory out there. Foles was pretty clearly gun-shy yesterday. Lots of double-clutching and hesitation. There are a lot of potential explanations, but I think it’s likely the whole “turnover avoidance” storyline got to him. If you had spent all offseason hearing about how great you were at not throwing interceptions, it’s probably natural for you to start trying to avoid them more consciously. Hopefully this is just a one-week issue. If he gets too far into his own head, though, things are going to get ugly. Cody Parkey – That was an excellent performance, far beyond anything I expected. The 51 yard FG was perfect, even moreso because it was the first real NFL kick of his career. Just as important, though, were the touchbacks. Parkey kicked off 7 times. 5 of them were touchbacks (or 72%). For reference, Alex Henery recorded a touchback on 41.5% of his kicks last season. It must be noted that conditions yesterday were very good, so we shouldn’t expect Parkey to maintain that touchback rate through the fall/winter. Still, it’s an area I highlighted for potential improvement for the Eagles, and so far that’s what we’ve seen. Marcus Smith – Not much to say here, the guy didn’t play. It’s too early to be concerned, but I’m keeping a close eye on this one. I realize he’s a “project”, but he dressed for the game and couldn’t get a single snap? That’s worrisome, especially because the Jaguars, despite the first half, are one of the more benign offenses the Eagles will face all year. If there was a time to get Smith a few live reps with relatively little risk, yesterday was it. Maybe the big deficit changed the plans. Even so, it’s hard to stomach having a healthy first round pick on the sidelines and not being able to find him a single live rep.
Special Teams – I mentioned Parkey, but it’s important to note that the entire unit was fantastic yesterday. Sproles provided a big spark as a punt returner, averaging 15.5 yards per attempt. Donnie Jones’ net average was just 33.7 yards, but that’s because he put 5 punts inside the 20 yard line. There just wasn’t room to kick it farther, and he did a great job of keeping the ball out of the end zone (with some help from the coverage team). I’ve said before that Special Teams plays a relatively small role when compared to Offense and Defense. That, however, assumes somewhat normal play from the unit. A great STs performance can have a much larger impact, as it did yesterday for the Eagles. Finally, it’s pretty amazing that the Eagles could look so bad for so long and still win a game by 17 points. The competition probably wasn’t good, but having a 34 point swing during a game almost never happens. It could be a sign that the Eagles just weren’t ready to play or overlooked the Jaguars. Hopefully that’s the case. Even if it’s not, though, watching the Cowboys and Washington play should have reminded everyone that the Eagles don’t need to be anywhere near “great” to win the division. As you all know, we should be thinking about this season in terms of an expected performance distribution. There are a range of outcomes for the Eagles this season, which varying probabilities for each related to how good/bad the team is. Today, I want to first talk conceptually about the distribution shape. Then I’ll move into the main topic: Injuries. I’m going to assume everyone knows the basics of a Normal Distribution (Bell Curve). I’ve used it often enough here that it shouldn’t be unknown. The relevant question is: how do NFL team performance distributions compare? 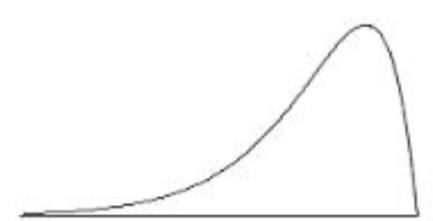 Using the Normal curve as a baseline allows us to logic our way through certain adjustments, leading us to a better mental model for understanding ex-ante team expectations. What do we think the shapes of NFL performance distributions are? I don’t have any data (yet), so we’re operating conceptually (as usual). Let’s start with Kurtosis, because it’s relatively straightforward and not as important for out topic today. In generally, I think NFL distributions are fairly Platykurtic. There is a LOT of luck in the NFL. That means a team’s “true” performance level is less likely to actually manifest than if there was little luck. That means ANY projection we make is fairly uncertain. As a result, it’s not enough to just say “expect 9 wins”. Any projection of value will also include an expected range, or at least some explanation of downside/upside outcomes. Now let’s look at skew, because that’s the more relevant measure right now. Perhaps the most important thing to note here is that performance for an NFL team, as I’ve defined it here (Wins), is bounded on both sides. No matter how bad a team is, it can’t win fewer than 0 games. No matter how good it is, it can’t win 16 games. Hence, when we’re looking at expected performance in terms of wins, the potential for outliers is limited. Taking the next step, that means the distributions almost certainly are skewed for every team, provided we accept one more assumption as true: it is possibly, at least in theory, for a team to achieve every possible outcome (0 – 16 wins), regardless of “true” ability or expectation. The Seahawks will almost certainly will more than 0 games this year…but it’s possible. Even if the odds of that outcome are extremely small, if they exist they must be present on the distribution curve. Similarly, a bad team will almost certainly not win 16 games. But an extraordinary run of luck (like opposing injuries) could, in theory, produce a very positive outcome, up to and including 16 wins. Again, the odds are close to zero, but they exist. That curve is negatively skewed, as are the curves for most “good” teams, for reasons I explained above. Now that we’ve settled that, we need to think about the reasons a good team might end up in the left side of the curve. Put differently, we know that the Eagles are a relatively “good” team. While their curve isn’t nearly as skewed as the Seahawks’, I do believe it’s still negatively skewed. Given that, we can start to think about WHY, beyond the theoretical reasons (bounded range of outcomes), a team’s left tail might exist/be significant. The most obvious reason is injuries. Injuries, especially those to star players, present the type of negative events that can result in a team finishing with an outcome towards the left side of the distribution. Here’s the important part: the Eagles are particularly susceptible this year, hence the team’s left tail is likely a bit larger than usual. That’s also a big reason why I’m keeping my expectations for the team’s win total in check. Outliers to the left side or a fat left tail will pull the mean of the distribution down. So if we’re just talking about average expected wins (there are certainly other ways to look at this), the Eagles “true” level is likely lower than many fans believe. If Nick Foles goes down….. If LeSean McCoy goes down….. If anyone on the offensive line goes down…. The Eagles are currently heavily dependent on just a few players. The defensive depth chart improved a bit this offseason, but the offense (largely responsible for the team’s performance las year) is still very brittle. The problem is, that brittleness was not readily apparent last year, and therefore is likely to be under-appreciated this year. With Football Outsiders’ Adjusted Games Lost (AGL) metric, we are able to quantify how much teams were affected by injuries based on two principles: (1) Injuries to starters, injury replacements and important situational reserves matter more than injuries to bench warmers; and (2) Injured players who do take the field are usually playing with reduced ability, which is why Adjusted Games Lost is based not strictly on whether the player is active for the game or not, but instead is based on the player’s listed status that week (IR/PUP, out, doubtful, questionable or probable). In 2012, the Eagles ranked 18th overall. Clearly, they were more effected by injuries in 2012 than they were last year. Similarly, the fact that the Eagles ranked 2nd last year combined with the relatively uncertain (non-persistant) nature of injuries means we should expect some mean-reversion. Basically, it’s likely the Eagles will be more negatively effected by injuries this year, relative to other teams, than they were last season. Of course, that itself doesn’t tell us much. We also need to know it injuries, as measured by AGL, actually affect performance (as measured by Wins). 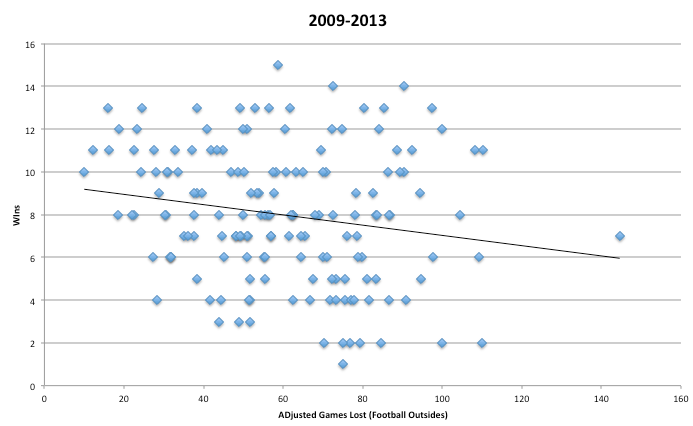 Well here’s the scatterplot showing AGL and corresponding Wins from 2009-2013. As you can see, there’s good news and bad news. The correlation value is -.185. If the Eagles revert towards the mean (as I expect them to), they’ll be relatively worse off than last year. However, the correlation is relatively weak, so the effect might not be catastrophic. Anecdotally, though, I think there’s reason to be concerned, particularly because I don’t like the QB/RB Depth Chart. An injury to a starter is bad (and shows up in AGL). However, if the drop-off in talent to the next guy isn’t huge, the effect won’t be significant. Unfortunately, the Eagles don’t have that luxury at QB. Moreover, LeSean McCoy is SO good that it’s really impossible to keep the gap between him and the 2nd stringer small. I should probably note here that I’m not trying to be overly pessimistic here. However, if we want to create a reasonably accurate performance expectation, we need to look carefully for risk factors. Injuries are always a major risk factor. But in the Eagles’ case, I think the risk is atypically large this year. That doesn’t mean they’ll occur, but it does mean or ex-ante projection needs to account for them. There’s much more to say around this topic, and I want to present a new version of the Depth Chart Over Time that will make potential injury risk more obvious. For now though, believe in the Eagles this year, but recognize that the existence of serious downside potential (negatively skewed) results in a mean win expectation that is lower than some might expect (I’ll get a number on it before the season starts). We can talk about median expectations some other time…. Sorry for the absence, combination of exams/vacation/world cup conspired to occupy all of my time. Fortunately, not much has happened that needs immediate reaction. At least until yesterday. As everyone knows by now, Lane Johnson is looking at a likely 4 game suspension after testing positive for PEDs. There are a few different angles to view this from, but let’s start with the most obvious, the effect on the Eagles. Clearly, this is a big loss. The Eagles offense is dependent on the run game, which in turn relies on the O-Line providing lanes for Shady to work with. Losing Johnson for four games means the Eagles, regardless of how they fill Johnson’s position, will see a decline in performance at RT. Moreover, assuming the Eagles fill the need from within (Allen Barbre is the favorite), the team is left VERY shallow at OL for the first four games. So an injury to another member of the OL would move the unit from a team strength to a glaring weakness. But you didn’t need me to tell you that. That’s the easy stuff. A more interesting angle from which to view this story is the overall use of PEDs in the NFL. Now I’m going to let you in on a little secret about PEDs….the NFL doesn’t care! Why would they? They make the players bigger, stronger, and faster; they don’t cost the owners anything; and the fans don’t really care either. The only real losers in this situation are the players themselves (assuming there are long-term negative health effects from PEDs). So why do they take them? It’s essentially a prisoner’s dilemma. In total, the players are probably better off if nobody uses PEDs. However, if only a few players take them, they are significantly better off than everyone else. Given the number of players in the league (hard to trust/coordinate with everyone) and the immense competition for every roster spot, the rational course of action for many players is to take the drugs! Especially when the first suspension is just 4 games. They can’t trust the testing policies to catch the cheaters, and they can’t trust the other players not to cheat. Theoretically, they could actually advocate for very strict testing procedures during CBA negotiations, but that’s a topic for another day. Ok, so obviously the incentives are pretty badly misaligned and there are structural issues within the league that suggests PED use should be fairly widespread. That brings me to the next angle to this story, and the only one I think the NFL secretly cares about (if only just a little). The Seattle Seahawks. Did you watch them last season? Bigger…stronger…faster. The team, top-to-bottom, looked to be in better physical condition than everyone they played against. Now remember they have a coach, Pete Carroll, who has a history of bending (and outright breaking) the rules. Most glaringly (perhaps I’m burying the lede here a bit), the Seahawks have led the league in PED suspensions since Carroll took over. That’s a lot of suspensions. But that’s not all. Do you think EVERYONE who uses PEDs gets caught? I don’t know enough about the testing procedures to suggest a catch rate, but we can use logic to figure this one out. If 100% of those who used got caught, nobody would use! Ok, maybe a couple of players who were either really stupid or simply believed their only chance was to use PEDs would still do it, but clearly it would be a very small number. Moving a bit further, look at the penalty for using. It’s only 4 games! Conceptually, think about the expected value of this situation. Option A: Don’t use PEDs, no chance of getting suspended but you are also at a competitive disadvantage. What’s the alternative employment for most of these players? The rookie minimum salary is $375,000. The veteran minimum is either $450,000 or $525,000 (with 2 years of service). What would these players earn outside the league? 10% of their NFL salary? 20%? That makes Option A borderline irrational, at least for players on the fringe. Option B: Use PEDs, gain competitive advantage (or at least avoid a disadvantage). We don’t know the odds of getting caught (I personally think they’re VERY low), but let’s be extremely conservative here and say 50%. So if you take option B, there’s a 50% chance you get away with it (at least for the first year, we can iterate this process to account for testing schedules and PED cycles but the overall point is the same). Conversely, there’s a 50% chance you get caught. If you do, you’re suspended for 4 games. So using PEDs carries an expected value of missing just 2 games? Against the benefits of using PEDs? Here’s where I should mention that for true fringe players, the downside of getting caught isn’t limited to just the suspension, it may actually cost them their roster spot and place in the league. However, we also have to acknowledge the likelihood that some of these players, without PEDs, wouldn’t make the team anyway. Add in the fact that the PED catch rate is almost certainly far less than 50%, and it’s pretty clear that using PEDs is an extremely attractive risk/reward opportunity. That ignores potential negative health effects. That may be important to you and me, but I’d suggest that by playing football (with all of the known concussion risks) is a clear signal that these players are not placing as high a value on long-term health as other’s perhaps would. The Seahawks appear to have this figured out. I’m not necessarily suggesting that Seattle has an organized, team-sanctioned PED program. They almost definitely do not. However, I am suggesting that there’s probably a don’t-ask/don’t-tell policy, and clearly a relaxed attitude that tacitly condones PED use. Again, that’s a perfectly rational way for Seattle to run its team. The team-wide benefits more than outweigh the risks. The occasional suspension is simply a cost of doing business. Fans can complain about it and other team’s can claim the moral high ground…but the Seahawks are the Super Bowl Champions. Enter Chip Kelly. Unconventional coach with a college background and a history of flouting the rules and pushing the envelope? Sound familiar? #SportsScience anyone? Needless to say, Lane Johnson’s suspension does not surprise me. Not even a little. Now let’s get controversial….I expect more suspensions under Chip Kelly. Not necessarily soon, but over the next couple of seasons. I’m not trying to pass moral judgment here, nor am I taking a side on whether I’d support PED use or not. Just reading the signs and coming to what I think is the most logical conclusion. The current league incentives encourage PED use (at least until a player gets their first suspension) and I think Chip Kelly realizes it. 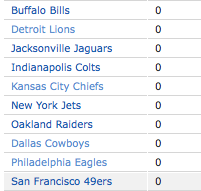 Note the Bengals, Texans, and Rams also had 3 suspensions each. The NFL…if you ain’t cheating, you ain’t trying.